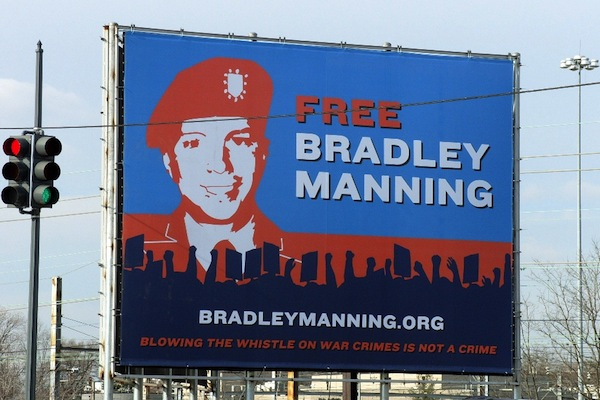 Bradley Edward Manning (born December 17, 1987) is a United States Army soldier who was arrested in May 2010 in Iraq on suspicion of having passed classified material to the website WikiLeaks. He was ultimately charged with 22 offenses, including communicating national defense information to an unauthorized source and aiding the enemy. This article by Chris McGreal delves into Manning's relationship with Adrian Lamo, a former hacker famous for breaking into computers at the New York Times. Lamo turned Manning in to authorities after the soldier bragged online about leaking 260,000 pages of confidential US diplomatic cables to WikiLeaks. Manning was arrested by US authorities while on duty in Iraq and held in Kuwait before being transferred to the marine base at Quantico, Virginia in July 2010. Guardian reporter Ed Pilkington's piece on Manning's unethical detainment in military prison details the first time the soldier spoke publicly about his treatment at Quantico. Manning said he was stripped to his underwear every night and forced to sit "in essential blindness", without his prescription eyeglasses. Manning also wrote an explicit firsthand account of his treatment in military custody in March 2011. This piece by Michael Ratner, attorney for Julian Assange and WikiLeaks in the United States, calls Manning's ongoing trial a "theater of the absurd". Ratner describes how the media and public were denied access to all evidence, court documents, court orders and off-the-record discussions that will ultimately seal Manning's fate. Ratner reveals how press and advocacy groups pressed the Department of Defense to open access to trial documents but were unsuccessful. In January of this year, US military prosecutors argued that Manning sought to aid al-Qaida through releasing classified documents. If convicted of those allegations, Manning could face life in prison. During a pre-trial, Prosecutor Capt Joe Morrow said that the government had access to evidence that high ranking al-Qaida operatives, including Osama bin Laden, saw some of the cables Manning released to WikiLeaks.